Here is my latest completed string and needle beading project. This is done using a diagonal peyote stitch. This is the first time I've used this stitch and I had a really hard time starting it because my bead count wasn't consistent, but after 5 tear-outs, I finally got it. This is fastened with sterling silver crimp tubes and S hook clasp. 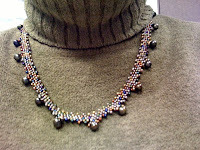 I used black KO beading thread and number 8 seed beads. I have a number 6 seed bead project using an even-count peyote stitch that I did earlier that I will post once I find a wide enough tube clasp. My next project is using number 11 seed beads and a right angle stitch pattern, much more difficult. I'll post these when they're finished. Dear Tracy, where did you find the pattern for this lovely necklace? Please let me know (if this is not too presumptuous to ask!) via e-mail to mbaird@lycos.co.uk. Your work is beautiful and I love your menagerie mind!